The Pluviophile Writer – Page 83 – Rain and book loving rantings of a dweeb: books, book reviews, cats, writing, fitness and general failure of adulting. Read from October 08 to 09, 2014. This book is dark and has the capabilities of making your skin crawl, it is however also whimsical. Just like childhood. There is only one other person that I can think of that writes about childhood this well and that’s Roald Dahl. Both Gaiman and Dahl seem to be able to recall so well what it’s like to be a child, including the dark side of it. Growing up is scary and it’s hard but it’s also wonderful. While Dahl is no longer with us, I’m thankful that there are authors like Gaiman around that can still make us feel like children. After returning to his childhood home after attending a funeral, the unnamed protagonist recalls the time he use to spend with his neighbour and childhood friend, Lettie Hempstock. He ventures over to his old neighbours and finds Lettie’s mother and recalls that Lettie has gone away to “Australia”. The protagonist initially remembers very little of his childhood but recalls a pond which Lettie used to say was her ocean and decides to venture down there to recollect some childhood memories. Sitting by the “pond” the man begins to remembers , it started with him losing his room as a boy so that his parents could let it out for some additional income. The opal miner had stayed with them, but after losing all the money that his friends and family gave him to gambling, he stole the family car and committing suicide in it. This death causes something unnatural to be released in to the world. While out with his father to retrieve the car, is when he meets Lettie. He is taken back to her home and introduced to her mother and grandmother. The unnatural spirit that was released when the opal miner died believes that money will make people happy but it’s leaving money for people in very horrible ways. When the narrator wakes up choking on a coin, he seeks help from Lettie. The boy quickly comes to realize that there is something very special about the Hempstock women and when he asks about their exact age they never give him a concise answer. The women decide that the spirit must be dealt with and brought back to its own world. Against her mother and grandmother’s discretion, Lettie convinces them to let her bring the young protagonist along with her to banish the spirit. Lettie tells the boy that he must not touch ANYTHING while he is in the spirit world and to hold her hand the entire time. The boy fails at this only once while in the surreal spirit world. After the spirit has been banished, the boy returns home from his adventure believing that everything has returned to normal. He finds however, that he has a gaping black hole in the bottom of his foot in which he can feel something moving around. He pulls out a worm from the hole in his foot and puts it down a drain, though he didn’t get all of it. The boy deals with the incident the way a curious child would, but as a reader this scene is has some serious gross factors and leaves you reeling! Sounds unnerving and awesome right?! It really is. Gaiman never lets you down. 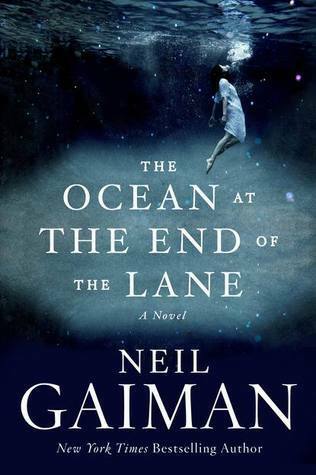 Gaiman, like in many of his other novels, likes to have mythological connections to his stories because in a way, it keeps them all connected. For example, Lettie, her mother, and her grandmother sound like the triple goddess of mythology: the maiden, the mother and the crone. Equally, Ursula seems to represent the whore. The whole novel seems to revolve around similar dichotomies, such as childhood and adulthood as well as what we perceive as real and what we imagine. Another interesting item that’s worth noting, just off some quick research, apparently some of the incidents in the book are in relation to some experiences that Gaiman had as a child, for example Gaiman’s father’s car was actually stolen and the thief did commit suicide in it. This novel is less than 200 pages so it makes for nice quick read and I think you’ll find yourself being properly creeped out and just in time for Halloween. You may even find yourself recollecting on your own wacky childhood adventures. A must-read for any adult that still has a child-like spirit. Read from August 26 to 28, 2014. Ree is a tough and resilient teenager of sixteen. She has had to take care of her two brothers and her mentally ill mother as her father has been involved with cooking up crystal meth and has recently skipped bail, a practice that is being taken up by a few farmers in the Ozark area. Unfortunately for Ree, her father is missing and if he doesn’t make his court date they will lose their home. Determined to save her home, Ree starts looking for her father but she is finding out that there aren’t too many people in town, even from her own extended family, who are willing to assist her. There is a secret that is being kept from her in regards to her father and Ree will do whatever it takes to find out what that is despite what danger she may find herself in. What makes this story remarkable isn’t the plot, as it’s fairly straight forward, but the character work. It’s absolutely impeccable. You feel for Ree but she is so remarkably tough. Having practically parented herself and raised both her brothers she is wise beyond her years and through Ree you start to get an idea of what her family is like and and see just how small the town is that she lives in. Woodrell is so masterful with his words, the book is short, yet you feel that you know so much about Ree. While the book is a bit dark, you find yourself just as determined as Ree so you never feel dismayed, enough though there are some difficult moments in the book. I think that anyone could read this book, it’s just executed so well. I’ve heard mixed reviews on the movie but I haven’t actually seen it myself. I could see that the plot line might not be enticing enough on screen, isn’t that the beauty of a book? However, now that I’ve read the book, I will give the movie a go. I’d say this is one of my favourite books of 2014 so far as it’s not very often you find a book that is this whole and well done. I’d recommend this novel to anyone looking for something intriguing, dark and beautiful. I know, this post has been a long time coming as it took longer than I anticipated to read the book nominations for this year but here we are! 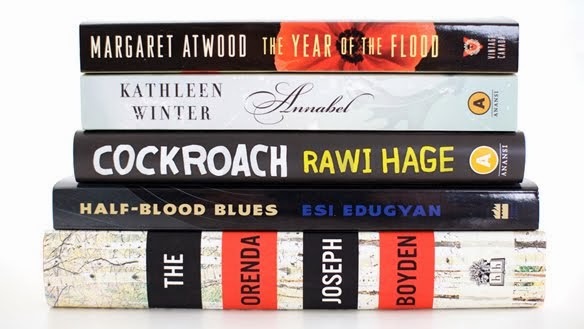 My final post on the Canada Reads 2014 series.